Creating a Family of Franchisees at HomeVestors of America Inc.
DePasse has worked at HomeVestors full-time since 2003 as its first in-house lawyer. During her fifteen-plus-year tenure with the company, she’s done more than just protect its growth with her legal expertise. She’s helped to make the legal team—currently composed of two lawyers, two paralegals, a legal assistant, two auditors and a collections specialist—into a team that focuses on keeping the company’s brand identity well-defined, establishing its ethical code, and sustaining strong personal ties among all of their teammates. 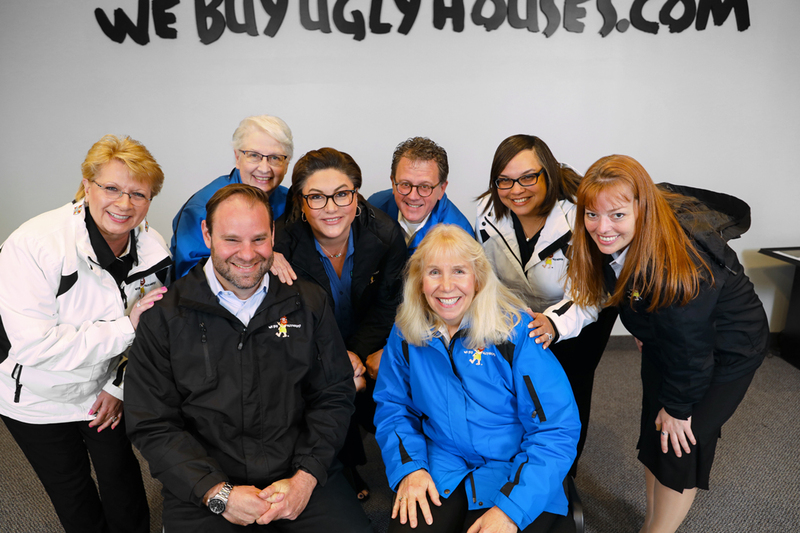 One of the first milestones on the road to HomeVestors’ current success was the development of its now-famous national marketing campaign slogan, “We Buy Ugly Houses,” which DePasse helps to protect every day. She shares that the slogan wasn’t an instant hit when it debuted in 1999. The late Ken D’Angelo, HomeVestors’ founder, had been brainstorming ways to help the franchisees attract the right types of qualified leads. He came up with the slogan “We Buy Ugly Houses,” which he planned to use on billboards across the country, and he brought it to various advertising agencies for feedback. 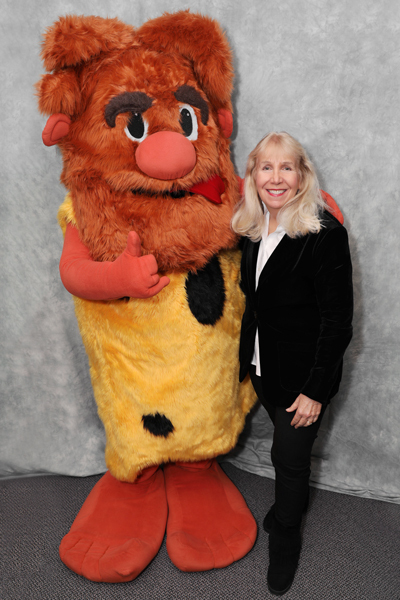 Bonnie DePasse stands with HomeVestors of America Inc.’s iconic mascot. “They all told him, ‘You can’t use this. No one responds to negative advertising. This won’t work. You’ve got to think of something else,’” DePasse says. Undeterred, D’Angelo trusted his instincts and paid for the original billboard with the slogan. It increased the quality of leads available to franchisees almost immediately. In fact, it’s had such demonstrable success that DePasse and her team registered it for federal trademark and have continuously spent considerable time defending it against infringement. “Ironically now, everybody wants to use it,” DePasse said. They have trademark protection down to a science: Typically, a potential trademark infringer comes to the HomeVestors legal team via a franchisee in the field or through a web crawling service. DePasse or her co-counsel will review the material and decide whether it legally qualifies as infringement. If so, the legal team investigates the infringer, including all of the infringer’s advertising. While the legal team handles infringement take downs of social media and advertising website posts in-house, a prolific infringer is sent to outside counsel at Wilson, Elser, Moskowitz, Edelman & Dicker LLP, who sends a cease-and-desist letter and, if necessary, files a lawsuit. At any given time, HomeVestors and Wilson Elser are managing multiple lawsuits in federal courts around the country. “We will lose our trademarks if we don’t defend them, so we have to defend them,” says DePasse. It’s her way of protecting the company’s name and “ugly family” of trademarks. Like any functional family, HomeVestors has a set of shared values, which DePasse helped to define early on. In the late ’90s, when DePasse was still working at the Harmon Law Firm P.C., where HomeVestors was her first client, she had a pivotal values-related conversation with D’Angelo. “He said, ‘I’m noticing the same mistakes being made repeatedly by new franchisees that come into the system, and we can’t afford to have these kinds of mistakes being made,’” DePasse remembers. D’Angelo proposed that they work on a set of proprietary, in-house rules that they could teach during initial training. Within an unlicensed industry, D’Angelo set out to create “a moral and ethical code to establish the best standards in the industry.” In short order, the two of them created and continue to update a document called HomeVestors of America Inc. Systems and Standards, which markedly decreased the types of errors that prompted its creation. The HomeVestors team has taught variations on that document to all new franchisees ever since. HomeVestors’ Systems and Standards got a major update in the wake of the financial crisis of 2008. The crisis forced HomeVestors to downsize considerably, and through that painful experience, the team learned what not to do so they could protect their company and help ensure that this severe a financial crisis did not happen to the company again. Both the written Systems and Standards document and DePasse’s teachings now reflect the lessons of that moment. “I teach several of the lender fraud schemes that helped to cause the financial demise in 2008. I teach them in every new training class so that they are aware that this type of behavior is against the law. It’s a felony. It’s mortgage fraud,” DePasse says. She notes that team members hold each other accountable for sustaining the company values, thereby ensuring one another’s success and compliance with all laws. Teamwork is one of the core values that makes HomeVestors successful, DePasse says. The close professional and interpersonal ties between her and her teammates, and throughout the organization, have lent it its family feel. She speaks with pride about how well the legal department collaborates to keep trademark infringement cases, contract review, franchise document preparation, audits, collections and litigation running smoothly. DePasse also has a literal family connection within the business: her daughter entered a blind submission to design the original HomeVestors mascot, UG, when she was fifteen years old, and her entry won. Perhaps most significantly, DePasse had a formative friendship with D’Angelo, whom she characterizes as kind, principled, and charismatic. “Ken was described to me by a franchisee as someone who had the charisma of a Disney character,” DePasse says, noting that the description rang true. When D’Angelo passed away in 2005 at the age of 55, the whole company felt his loss deeply. As HVA’s premier investor insurance provider for over ten years, Arcana Insurance Services has had the pleasure of working with Bonnie DePasse in addressing the many market challenges within the real estate investment sector. Her professionalism and leading-edge knowledge have allowed both organizations to move quickly in addressing pertinent matters to ensure the on-going success of the organization. We join all of her collogues at HVA in celebrating her achievements and leadership. As demonstrated by its WAVE (Women Attorneys Valued & Empowered) initiative, Wilson Elser takes a progressive approach toward advancing the professional and personal well-being of its women attorneys. We are fortunate to work with like-minded organizations such as HomeVestors of America and salute Bonnie DePasse for her efforts on behalf of her company and the greater legal community.